That coat of arms gets everywhere, part 379! Here it is again, St Mungo with the bell, fish, tree and bird, this time on a lamppost just outside the entrance to the Botanic Gardens. This entry was posted on June 21, 2009 at 12:01 am	and is filed under Uncategorized. Tagged: coat of arms, Glasgow, Let Glasgow Flourish. You can follow any responses to this entry through the RSS 2.0 feed. Both comments and pings are currently closed. He’s everywhere, he’s everywhere. (I’m on a lookout for one in LA county. I bet I can find one at least. 🙂 Definitely an unusual spot for St. Mungo – well spotted. With such a great-looking coat of arms, I’m not surprised it’s showing up everywhere. I think it’s great that the people of Glasgow are proud enough to use it! Fantastic art. I love to see such carvings! Very nicely done! 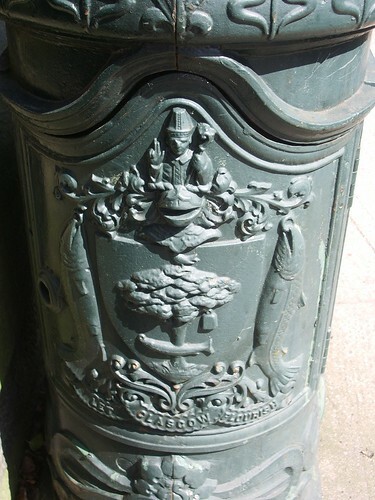 This is a very good idea: I am gong to hunt the coat of arms of my city from trash bins to street lights. Thank you for the ‘inspiration’.